We asked for your questions, and more than 600 readers responded. This is the second in a series of Q&As based on those questions. The Alaskan Way Viaduct closes permanently the night of Jan. 11, and the new Highway 99 tunnel will open the week of Feb. 4, after crews finish new ramps that connect the tunnel to surface roadways. That means travelers for three weeks will have neither a viaduct nor the replacement tunnel to get through downtown, and some ramps in Sodo will close an additional week or two. Expect major congestion and traffic delays. You can send us additional questions, and read our first installment of questions and answers, at st.news/tunnel. This is the second in a series of Q&As based on reader questions. Part 4: Will we get “one last drive” on the viaduct? Will there be Wi-Fi inside the tunnel? How can drivers get to downtown from the south end during the big closure? How can drivers get to downtown from the north end during the big closure? Will there be extra transit during the three-week closure? How do I drive to and from ferries? Will transit services use the tunnel? What is going to happen to the Battery Street Tunnel? Are pedestrian and bike paths going to stay open? What is going to happen to the property under the viaduct? How can drivers get downtown from the south end during the big closure? Road lanes from the West Seattle Bridge and Duwamish area onto Highway 99 will be closed completely during the changeover to the tunnel from Jan. 11 to early February. For another two weeks after the tunnel opens, drivers from West Seattle and Burien still won’t be able to use the new Alaskan Way South exit at Sodo. Once you pass the West Seattle Bridge you must continue north through the tunnel until the Mercer Street exit — until the Sodo exit is completed. First and Fourth avenues south will be available but crowded. Drivers using First have an option to exit left and continue north using the temporary four-lane Alaskan Way that was paved in October. How can drivers get downtown from the north end during the big closure? Despite the Jan. 11 viaduct closure, drivers on Aurora Avenue North can reach Belltown and downtown using the Denny Way exit. Expect delays. During the worst three weeks, all three lanes of Aurora entering South Lake Union will be forced into only one lane at Republican Street. Drivers who endure that can proceed through the Battery Street Tunnel, but must exit at the short offramp to Western Avenue. Ballard, Magnolia and Interbay drivers lose the viaduct Jan. 11, and therefore permanently lose direct Highway 99 access via Elliott Avenue. To bypass downtown they might descend Broad Street to slog along the waterfront Alaskan Way, navigate Mercer Street or neighborhood arterials to Aurora, or go east to I-5 taking busy roads such like North 50th Street or North 85th Street. When the tunnel connections are done in February, drivers can take the revised left-side Denny Way exit from southbound Aurora Avenue to enter downtown. Or they can drive through the tunnel, take the left-side exit at the Sodo end, then backtrack toward Pioneer Square using First Avenue South. King County Metro will keep 20 buses on standby for both the Aurora and West Seattle sides of the city, to maintain frequent service when other buses are stuck in traffic. The West Seattle Water Taxi will add a second boat, to supplement the 278-passenger M/V Doc Maynard. Additional minibuses will serve feeder-bus routes 773 and 775 to Seacrest Dock. A temporary park-and-ride lot of 250 spaces, with shuttles to the boats, will operate at Pier 2, across from the 7-Eleven store on Harbor Avenue Southwest. Sound Transit won’t add capacity, because its train fleet is maxed out. Leaders didn’t order more trains early enough to beat the early-2019 crowds, and that group of 122 new rail cars won’t be available until a few months before Northgate, Roosevelt and U District stations open in September 2021. The main vehicle corridor to Colman Dock remains on the south side, where car holding lanes are provided alongside Pier 48, just off South Jackson Street. The entrance is alongside the temporary four-lane waterfront Alaskan Way surface street that was repaved in October. To get there from Sodo, exit First Avenue South onto diagonal Railroad Avenue South next to CenturyLink Field, to continue north toward Pier 48. Drivers can also reach Colman Dock from points north but expect stoplights and lane closures on surface Alaskan Way. Watch for orange-marked detours, until the $373 million dock rebuild finishes in 2023. Drivers arriving from Bainbridge or Bremerton can go south to the new Alaskan Way South interchange, and continue toward West Seattle or SeaTac on Highway 99. They could also turn east to Dearborn Avenue South, and backtrack into downtown. Or they can follow the signs to I-5 or I-90 via Edgar Martinez Drive. Eventually, the permanent Alaskan Way will add two left-turn lanes for ferry customers to drive onto Colman Dock at Yesler Way, in 2021. Walking advocates and Pioneer Square supporters have denounced that design because it creates a difficult 111-foot-wide crossing — as vast as Mercer Street. Will transit use the tunnel? 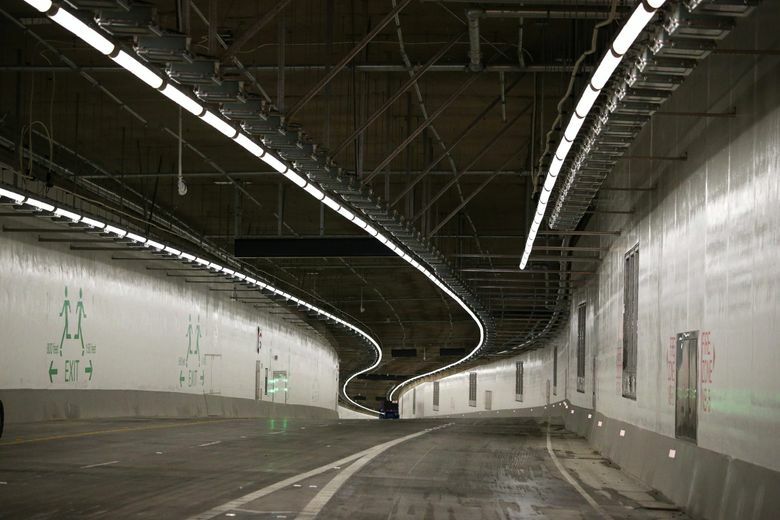 King County Metro has no near-term plans to use the tunnel. Unlike the viaduct, the tunnel lacks mid-downtown ramps that are currently used by almost 30,000 daily riders. Buses that now travel the viaduct will change to surface streets, so they can still reach busy downtown stations. Employer-sponsored buses, airport shuttles, tour vehicles and registered vanpools will probably use the tunnel to avoid downtown congestion. A long-term Metro plan suggests tunnel express routes by 2040. What happens to the Battery Street Tunnel? The Battery Street Tunnel is expected to remain open through Feb. 1. Drivers can enter and exit Belltown using the short Western Avenue ramps, but the viaduct south of there will close. Battery Street Tunnel will be decommissioned once the new Highway 99 tunnel opens in early February. Electric wires, storm drains, ventilation fans, fire sprinklers, a city water supply and lights must be removed or relocated. Contractors will fill it with pulverized viaduct rubble, to be topped by pumped-in low-density concrete. Hundreds of citizens walked the Battery Street Tunnel last year to support reuse of the space as a garden, homeless camp, or linear park — ideas the city and state rejected. Are walk and bike paths open? Yes. A temporary steel pedestrian bridge, from First Avenue to the ferry terminal, will be installed when demolition begins in February, to maintain access after the existing pedestrian bridge is removed. The city intends to build a larger parklike bridge later, for its waterfront redevelopment plan. The Portside Trail along Terminal 46, used by West Seattle bicyclists and residents of the St. Martin de Porres shelter, will remain open. Temporary sidewalk closures are expected near the triangular Flatiron Building and other blocks immediately beneath the ever-shifting demolition sites. What happens to land under the viaduct? That property is public right-of-way and will be retaken for roads or recreation: a surface Alaskan Way that varies from four to nine lanes; a waterfront promenade 12- to 40-feet wide; trees, flowers and grasses; a two-way bike trail; bus stops, and curbside parking. Altogether there will be 20 acres for parks and walkways, when leftover street property is combined with existing dock parks and the new Overlook Walk lid being built from Pike Place Market to Seattle Aquarium, said Marshall Foster, waterfront projects director for the city of Seattle. The wooden Pier 62, former home of summer concerts, is being replaced. Staff Reporter Michelle Baruchman contributed to this report.